Because your values are a key foundational element to your company and strategic plan, you want to be doubly sure they’re the right ones. You don’t set or establish core values; you discover them. The exercise that follows will help you focus on discovering shared values within your organization by starting with individual’s values and moving up to the organization. What are the core values and beliefs of our company? Solicit a list of five to seven core values from each of your key staff members and senior management team. Ask each person to provide the list of values to you individually through a survey or e-mail by answering the questions earlier in this section. Unlike with the mission and vision exercises, values are best solicited individually instead of in a group to begin with. Request that people explain each value they provide. Merge the lists provided by combining values that are listed more than once. The purpose here is to develop a draft list of values. You may have more than five to seven at this time. Bring the group together to discuss the list of values. Ask people to comment on what’s listed. Revise and modify until you’ve generated a final values statement. Evaluate each value against the checklist in the Values Evaluation Worksheet on the CD for effectiveness. You can do this step as a group or individually. Put the finishing touches on the values statement and communicate across the company. 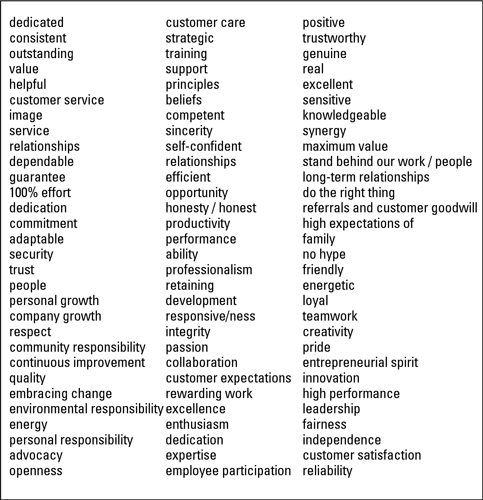 Need some ideas to get started on discovering your organizational values? See the figure for a bunch of words that you can use to stimulate those gray cells. Give a copy to your values team to help the members generate their individual list.